the apprentice of Jedi Knight Anakin Skywalker. In 2008, in the animated Star Wars: The Clone Wars movie and the ensuing TV series, Star Wars fans all over the world were introduced to a new character: Ahsoka Tano, a teenaged Togruta Padawan learner. 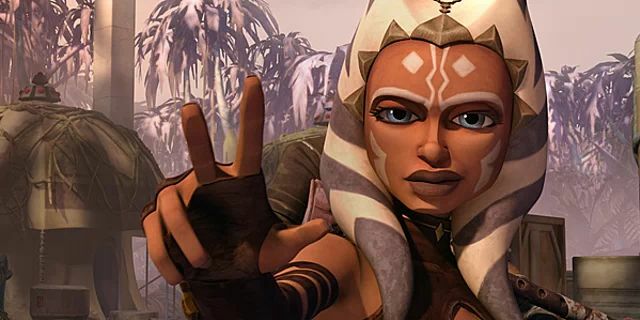 According to George Lucas, Ahsoka was developed for the series to demonstrate Anakin’s growth from the impetuous, headstrong Padawan in Star Wars II: Attack of the Clones to the more disciplined Knight of Star Wars III: Revenge of the Sith. By giving Anakin a Padawan of his own, they were essentially putting him into a father role that would drive him to become more cautious and embrace his responsibilities. And not only that, but by putting him through the experience of Master and Apprentice from the other side of the fence—as it were—they meant to strengthen and lend understanding to his relationship with Obi-Wan. The decision to make Anakin’s Padawan a young woman was made when Lucas said he “knew something about the subject,” having raised two daughters of his own. Although Star Wars: The Clone Wars has long since reached its untimely end, Ahsoka has endured and grown up independent of it, going on to join the new crew in the current series Star Wars: Rebels. Since her inception, Ahsoka has gone on to garner thousands of fans—boys and girls alike, and here are five of the many reasons why. 1. She’s brave and determined, and she never gives up. Due to equal parts Jedi training, Anakin’s teachings, and her own innate unshakable spirit, Ahsoka is fearless both on and off the battlefield. She’s always right behind her Master—and sometimes in front of him—as they lead their clone troops into battle. And even without her Master, that fearlessness never wavers. On one occasion, Ahsoka was kidnapped and dumped with other captured Jedi Padawans on an abandoned planet to be live game for barbarian Trandoshan hunters. Not once did Ahsoka give up hope. She led her fellow Padawans against their captors in escape attempt after escape attempt, relying on her Jedi teachings and her Master’s guidance: stealing weapons and airships and making allies out of their captors’ other prisoners. Her leadership and courage not only freed her fellow captives but reunited her with her Master. 2. She and Anakin made a perfect—if unlikely—pair of Master and Apprentice. They are a lot alike, Anakin and Ahsoka. Both are brash, possessed of an almost ungodly amount of courage and a certain disregard for rules. When they first meet, Anakin and Obi-Wan are in the middle of a war zone on the planet Christophsis, and it was Obi-Wan who had put in an offer to take on a new Padawan, not Anakin. But Master Yoda felt that it was time Anakin honoured the age-old Jedi tradition of passing down knowledge to the next generation, and he was convinced that if Anakin had an apprentice of his own it would teach him patience and responsibility. The majority of Ahsoka’s first mission in that war zone was spent trading jabs with her new Master; she dubbing him “Skyguy” and he calling her “Snips” for her “snippy” attitude. Their equally headstrong natures were not long in getting them into trouble. On the way to deactivate an enemy forcefield that was causing problems for their troops, they got themselves ambushed by enemy droids and Ahsoka very nearly squashed her new Master to death when she Force-pulled a wall down on top of the droids attacking him. But despite such a rocky start, Anakin was impressed by her resourcefulness and her bravery, and made no effort to get her transferred to another Master. 3. Her kind heart is equal to few others. There are many times Ahsoka looked after the welfare of the clone troops under her command and that of her Master, and she not only cared about many of them but grieved deeply when they died in battle. She also has a soft spot for children. When rescuing Force-sensitive infants from infamous bounty hunter Cad Bane, Ahsoka tirelessly and without complaint helped care for them until Jedi reinforcements arrived. In other instances, she undertook the task of teaching a class on political corruption to young cadets on the planet Mandalore and lent an understanding and helpful ear as they attempted to apply what they learned to their own lives. She also escorted and protected Jedi younglings as they completed the ancient Jedi tradition of seeking and claiming a lightsaber crystal on the planet Ilum, and offered guidance as the younglings assembled their lightsabers. 4. Like the most exemplary of her Order, she is selfless in her protection of others. It is the duty of the Jedi to serve and protect, to be peacekeepers, and sometimes warriors when the need arises. And sometimes it falls to the Jedi to make the most ultimate of sacrifices when protecting others. In this, Ahsoka is as steadfast and sure of heart as any of the Knights and Masters to come before her. During a mission when she and her Master were paired with another Master-Padawan duo of Jedi Knight Luminara Unduli and her apprentice Barriss Offee, Ahsoka and her fellow Padawan were assigned the task of planting and setting explosive charges to bring down an enemy droid facility. Over the course of the mission, Ahsoka and Barriss were not only separated from their Masters, but they were faced with a terrible choice: saving potentially thousands of lives or their own. In the end, both Padawans followed the teachings of the Jedi and their Masters and made the choice that would preserve thousands of innocents. 5. In the end, Ahsoka is unafraid to walk her own path. There came a time when Ahsoka was framed for a grave act of violence against the Jedi Temple, expelled from the Order and forced to go on the run. She was eventually cleared and the perpetrator was caught, but the damage had been done. She refused the offer to return her to the Order and chose to leave the Jedi behind to find her own way in the galaxy. In doing this, she was leaving behind not only the Master she had come to view as a father but the only family she had ever had. Ahsoka had been found as a very young child by Master Plo Koon of the Jedi Council, abandoned by her parents, and she was raised in the Temple until the age of fourteen, when she was chosen by Master Yoda to be the apprentice of Anakin Skywalker. I don’t know about you, but it would take a great strength of will that I do not possess to walk away from and sever ties with the only family I’ve ever known. For those of us who are steeped in Star Wars lore and know what was to come in Star Wars III: The Revenge of the Sith, we now know that Ahsoka’s courageous decision spared her from the genocide that wiped out the Jedi and destroyed the Republic, enabling her to return in the new series Star Wars: Rebels. Are you an Ahsoka fan? What do you love most about her? Ahsoka is my favorite SW character. She is my Favorite Star Wars Character, too. Gah!! Ahsoka is my favourite character from Clone Wars! And for all of those reasons!!! She is so fantabulous and Anakin and her together are just like... Awesome. But as a father/daughter or brother/sister relationship, no other way. I cry every time Ahsoka leaves!!! Agh! It breaks Anakin's heart so much... And mine too. Okay, pardon me, but I need to go sob for the rest of the week.